ABC and ESPN Broadcast Hot Wheels® World-Record Attempt Live From X Games Los Angeles 2012 | Mattel Inc.
EL SEGUNDO, Calif.--(BUSINESS WIRE)-- On Saturday, June 30, fans around the world will be able to tune-in to ABC and ESPN as Team Hot Wheels™ attempts to set a new world-record racing two vehicles through a six-story double vertical loop at X Games Los Angeles 2012. The life-sized Hot Wheels® Double Loop Dare will be broadcast live nationally beginning at 11:15 a.m. PDT on ABC, and globally on ESPN's international networks. People will be on the edge of their seat as the two Team Hot Wheels™ drivers carefully accelerate to 52 MPH entering the 60 ft. tall loop, braving a force of 7 Gs as they circle through. The challenge attempt will be taken on by Team Hot Wheels™ Yellow Driver, Tanner Foust, a three-time X Games Gold medalist and two-time Formula Drift Champion, who also successfully landed Hot Wheels' world-record-breaking distance jump at last year's Indianapolis 500 and Green Driver Greg Tracy. Greg, one of the top stuntmen in Hollywood and six-time Pikes Peak Champion, brings more than two decades of experience to the challenge. Team Hot Wheels Double Loop Dare world record attempt will be viewable across all entertainment platforms beginning June 30th. 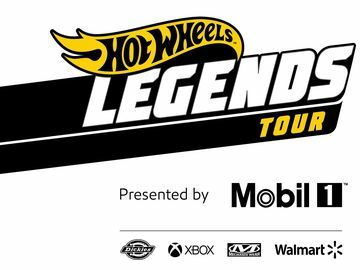 Mobile & Social Media: Fans can watch the replay of the Double Loop Dare on the Hot Wheels® Facebook page, www.HotWheels.com and YouTube channel. Follow the stunt live via #DoubleLoop on Twitter. Apptivity™ from Mattel seamlessly blends physical toys with the iPad into one immersive play experience fitting the demands of today's tech savvy kid. Once placed onscreen, Apptivity™ toys interact with corresponding apps that open a world of play possibilities and discovery with the Mattel brands kids love and parents trust. Specially engineered Apptivity™ toys are screen-safe and are the perfect playtime companions for the kid and kid-at-heart with great gameplay, adventurous storylines and rich content. Special technology integrated in the vehicle interacts with the app letting kids customize their driving style, swerve past obstacles or just cut loose and burn rubber around the race track. With three included games, kids will have a blast racing Hot Wheels® cars on their iPad. Team Hot Wheels™ Apptivity for the iPad is available now exclusively at Apple retail stores and at Apple.com. Average retail price is $19.99 (which includes two vehicles). Team Hot Wheels™ Apptivity is available for free from the App Store on iPad or at www.itunes.com/appstore. Play out the Double Loop Dare at home and be part Team Hot Wheels™ excitement with thrill inspired toys and track sets. Hot Wheels® Double Dare Snare™ track set available globally and the toy inspiration for the Double Loop Dare X Games stunt lets boys race their 1:64 scale Hot Wheels® cars side-by-side in a vertical loop competition just like what they will see at the X Games. Hot Wheels® X Games 1:64: Now through June 29th, fans in the United States visiting the Hot Wheels® Facebook page have the chance to win a special-edition 1:64 die-cast commemorative car when they vote for which driver they think will complete the Double Loop Dare first. Vote now for your chance to win! Hot Wheels® teams with new music partners to celebrate the epic world-record attempt. 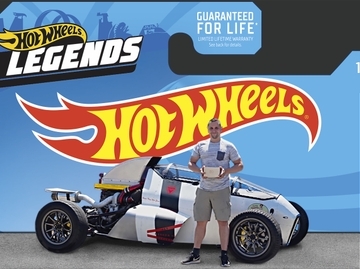 Big Machine Records: Hot Wheels® has teamed with Big Machine Records—the record label home to Country superstars like Taylor Swift, Tim McGraw, Rascal Flatts—as part of a long-term music partnership that will kick-off at the X Games Los Angeles. Visit Big Machine Records on Facebook. RDGLDGRN: Will be featured on three pieces of content with a remix of their hit "I Love Lamp" to get fans excited for the world record attempt. For more information and to get an inside look at the action leading up to the stunt fans can visit www.hotwheels.com/teamhw to follow Team Hot Wheels™ race to the X Games. PLEASE VISIT WWW.HOTWHEELSMEDIA.COM FOR ADDITIONAL PRESS DETAILS, HIGH-RESOLUTION IMAGES AND BROADCAST-QUALITY, DOWNLOADABLE B-ROLL. Mattel, Inc. (NASDAQ:MAT) (www.mattel.com) is the worldwide leader in the design, manufacture and marketing of toys and family products. The Mattel family is comprised of such best-selling brands as Barbie®, the most popular fashion doll ever introduced, Hot Wheels®, Matchbox®, American Girl®, Radica® and Hot Wheels® RC, as well as Fisher-Price® brands, including Little People®, Power Wheels® and a wide array of entertainment-inspired toy lines. In 2011, Mattel was named as one of FORTUNE Magazine's "100 Best Companies to Work For" for the fourth year in a row, and also is ranked among Corporate Responsibility Magazine's "100 Best Corporate Citizens." With worldwide headquarters in El Segundo, Calif., Mattel employs approximately 30,000 people in 43 countries and territories and sells products in more than 150 nations. At Mattel, we are "Creating the Future of Play™."